Today I have some sweetness to share with y'all! 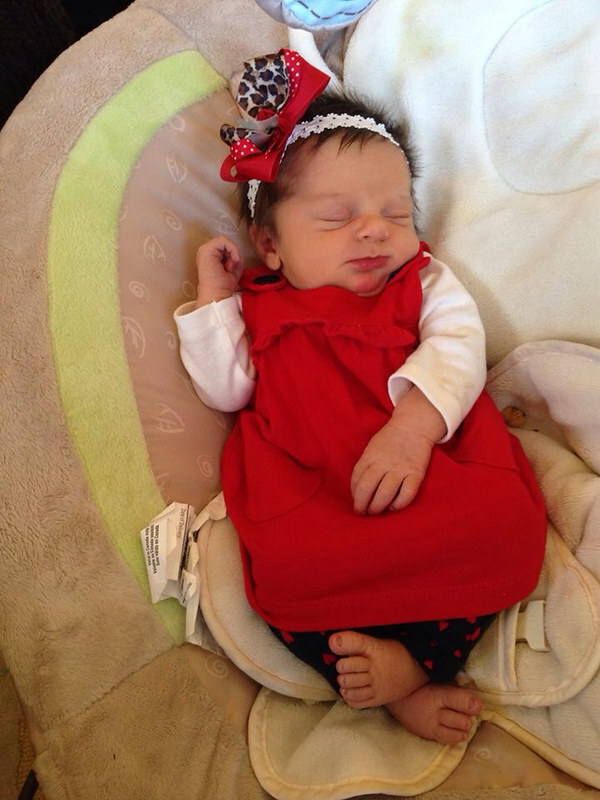 My dear friend, Kat, just had her second little girl last week and all I can say is...ADORABLE! I am now ready for number three (or maybe more like after we move). Kat decided to decorate her nursery in this adorable mod elephant fabric she found on Spoonflower and had a gal on Etsy make the crib set. I almost bought some of the same fabric to make the baby quilt, but then I came across a brand new collection out by Cori Dantini called Hello World. Isn't that name just perfect?!? Her fabrics are just so whimsical that I couldn't resist. 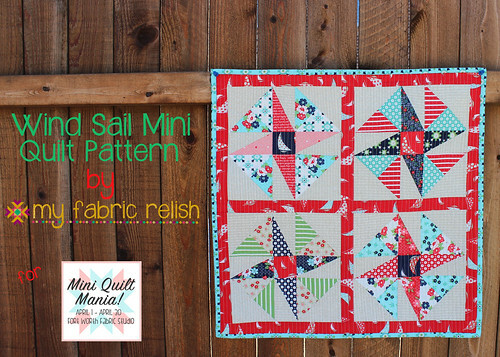 I couldn't resist so much that I bought a half-yard bundle as well instead of the FQ bundle that would have sufficed. Oops. I thought long and hard on what pattern I wanted to do but knew I wanted to highlight the elephant panel... so a giant log cabin it was going to be. All of Dantini's art has this mixed media feel with text and drawings with a few coffee/tea stains mixed in. I added some Madrona Road text fabric and a little bit of green, I cut a couple of strips of varying widths from the 1/2 yard cuts and then just pieced until I was all out. I also had enough to make a mini wall hanging or to give to the new babies big sister as a doll quilt. I decided to mimic the bunting fabric on the back with the quilting but still not 100% happy with how that turned out. Sorry I forgot to take a picture of the back but its all in the bunting print you see on the front. So fun! 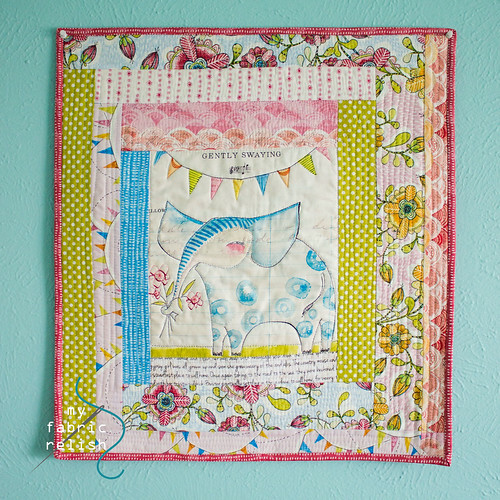 I had a little fun FMQing the centers and outlined the elephant, flowers and bunting. I really enjoy that type of FMQing (on a small scale of course). On the wall hanging, it's just lines echoing around the elephant print. I forgot to measure the mini quilt, but the baby quilt measures exactly the width of fabric at 42 inches. I have some other Cori Dantini panel prints with fairies that I hope to FMQ all artsy fartsy to make some wall hangings for my girls. Someday. On another positive note, looks like we are moving in a few weeks. Our new house won't be ready until the beginning of summer so we found a townhome that will be slightly more "cozy" but perfect for the time being. I will have to set up shop in the master bedroom though. I don't know if that is a good or bad thing...haha! Sorry Mr. Relish, you might want to get some ear plugs. 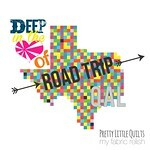 I also want to give Alyce from Blossom Heart Quilts a big shout out & thank you hug for listing my blog as one of her "three loves". When I opened up her post from Bloglovin, I was itching to see the three she loves and when I saw my blog first, I just about died! It truly made my week! I know I have been quiet lately because of all the craziness and I am so sorry. 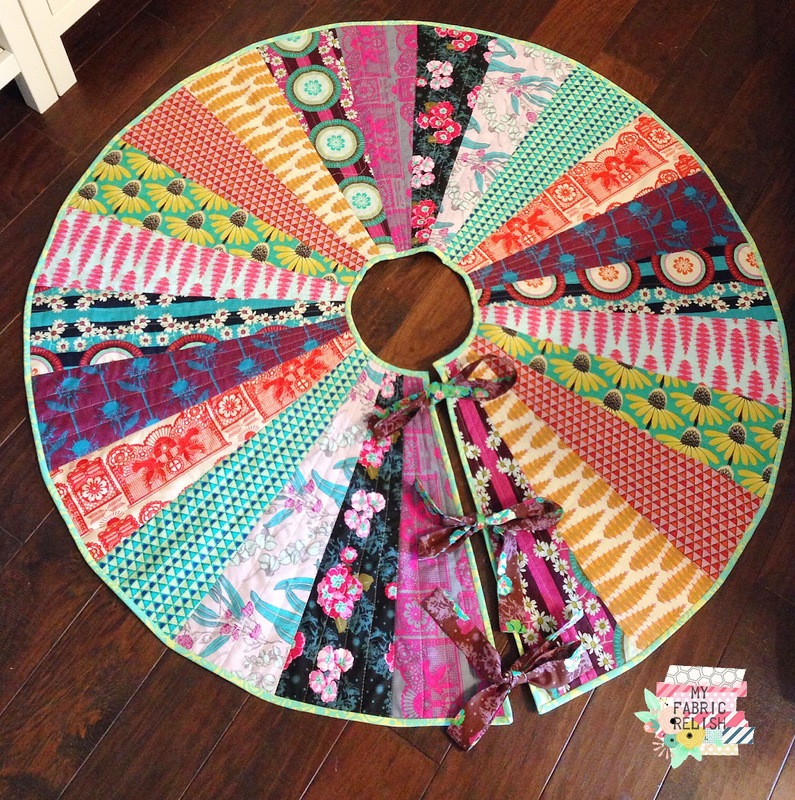 If I have any free time, I would rather sew and if I am able to share what I sew, then that's even better. At least I will have a back log of projects to share in case something catastrophic happens like all my machines going in to get repaired at the same time....that would be a sewpocalypse! Anywho, make sure you go check out Alyce's post and introduction to her new series. 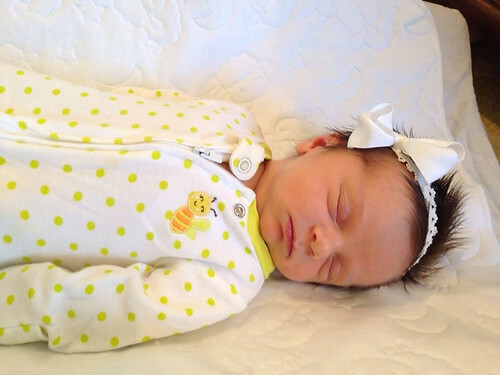 Ok, one more baby picture...eek! That is the sweetest little baby! I love those little piggies in that bottom shot! 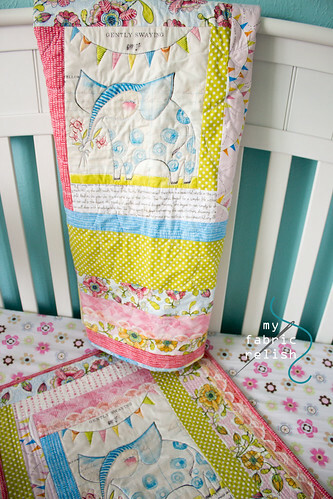 Great job on highlighting that adorable elephant fabric! Congrats! She's precious and so is the quilt! Oh my goodness. She is just precious. And I am sure you will find good use for that extra fabric ! Its adorable. 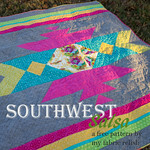 what a pretty baby and such long toes she has.A lovely quilt which I am sure she will love. Best of luck with your move. 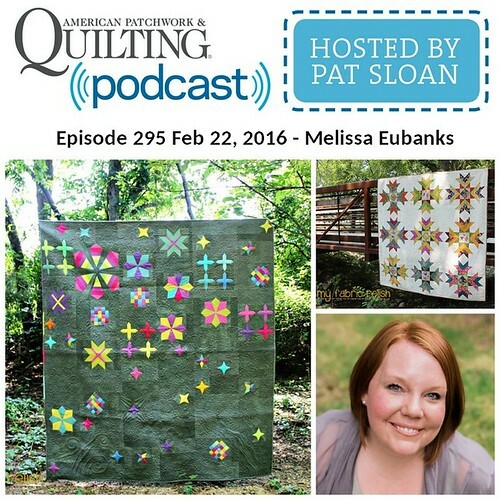 Great job and I am a huge fan of Dantini's work (mainly fabric)! Your quilt is wonderful but the recipient stole the show ;) SO adorable! 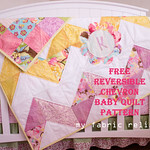 Such a sweet quilt and the baby adorable!